The Telegraph, Mail and BBC are among the media outlets trailing a major announcement by David Cameron on the establishment of a uniformed and specially-trained border police force. Visiting a police station in Wapping later today the Conservative leader will announce that former Met Chief John Stevens has agreed to head a working group on the establishment of this border police force. "Right now, our society is not properly defended against the drug dealers, people smugglers, gun importers and terrorists who find it all too easy to bypass the current system. No single organisation is responsible for performing this vital task. Instead we have at least six separate agencies, including Revenue and Customs, the Immigration Service, the security services, harbour police, Soca (Serious and Organised Crime Agency), and the Metropolitan Police." The Tories insist that the border police force will be paid for by scrapping Labour's ID cards scheme and from other economies at the Home Office. Labour question the Tory sums. Immigration minister Liam Byrne told The Telegraph that charges for ID cards scheme will make it self-financing. "How is he going to pay for his plans?," Mr Byne asked, "There is no magic pot of cash for ID cards sitting in the Home Office for him to switch, so he will have to introduce new taxes to pay for it." ID cards will be self financing?? Is that Labour speak for we'll specially tax you for it. You really get a sense of what this government is all about when a statement like 'so he will have to introduce new taxes to pay for it.' Shows they have no idea about diverting spending. This policy seemed to have popular approval at the last election and appears to be common sense. Whatever our immigration, international crime or anti-terrorism policy, they are irrelevantly ineffective without border control. The EU dictatorship will of course endeavour to block such a move. If you hadn't previously broken ranks on some other aspect of EU membership, thereby beginning the process of restoring our parliamentary supremacy, then that is when I would resume voting Tory. I do hope Mr Cameron will also address the situation with the EU, in particular in what way for instance will his proposed border police fit in with the EU Commision plans for a European Agency for the Management of Operational Co-operation at the External Borders" [COM(2003) 687, 11.11.03. Ref 1]. Considering the EU has already set-up "operational-coordination centres" on land borders", sea borders and "airports"; a Risk Analysis Centre and a number of other joint operations. Will the British border police work with the EU border police or will they become part of the EU force? Increasing border police is a waste of money. Criminals are cleverer and we have miles of undefendable coast line. Far better to spend the money on an identity card system so that criminals cannot operate when they get here. Illegal immigrants and criminals make rational economic decisions. At present the incentives are too high and the penalties too low. What does it matter if you are caught at the border? Claim asylum and disappear. Without identity cards you are unlikely ever to be found out again - you can access free healthcare and free education and get free housing because there are no effective checks. Smuggling is a function of government excise greed and drug smuggling is a result of the failure of Prohibition. Making us all queue for hours a la JFK and pay for the privilege is the smack of firm government on a hollow drum. Border police- good idea; but what about removals( and i'm not talking about Pickfords)? Brilliant idea! Will go a long way towards reducing stret crime too! Jonathan, if the criminals are that clever, it won't be long before they find a way of duplicating ID cards details. Keeping a system that stays ahead of the criminals in this respect will be an ongoing cost of billions. Far in excess of what a bit of free housing would cost. So Blu Lab are saying "Your countries borders protected"? Mmmmm. Now where have I heard that one before? "Border police- good idea; but what about removals( and i'm not talking about Pickfords)?" Good point. We here a lot of rhetoric about stopping illegal immigrants from coming in but less about the procedures for removing them. Whoever it was that used the phrase "What part of send them back don't you understand" in the last election was clearly going too far but the fact is that overwhelming public opposition to mass immigration also equates to overwhelming public support for the reduction of illegals residing here. The Home Office has presumably budgeted for the establishment of the regional centres for passport applications in person and their eventual roll out to every passport renewal. A pledge to abolish them and keep to the existing system, apart from being (1) consistent with David Davis' giving of formal notice on the consequences of scrapping the ID card project (2) very popular, may enable some reallocation of finance for this purpose. May I suggest this new force wear tails to differentiate themselves. Without wishing to put too fine a point on it; now do you see why politics will not be accountable until we regain our legal sovereignty. Why not choose the only sane solution? You can let in who you like but at least you stand a chance of counting them and planning accordingly. Any other policy is simple political posturing of the Blair variety. A fake passport in some EU countries cost as little as 300 quid. It doesn't matter if they can duplicate or forge ID cards. The cards themselves are irrelevant. They are just the visible symbol of a central database. To prove your identity you won't offer the card you will offer a fingerprint and probably a PIN. The fingerprint will be checked via the internet against a national database to confirm identity. If you are silly enough to offer a different (forged)ID card to that central register then you can be arrested and deported, case closed. Border police are just a macho display of action. They will be a total nuisance to tourists and businessmen but do nothing to police the wicked as there will still be no coherent system to check that the identity of entrants is what they say it is. It doesn't matter how long the Border police hold people up at the ports or how intimately they search them, if they still have eventually to let them in for lack of any confirmatory evidence of false identity. to stop illegals using Scotland as a back door into England. "Right now, our society is not properly defended against the drug dealers, people smugglers, gun importers and terrorists who find it all too easy to bypass the current system." I suspect people might be getting weary of hearing me on this topic, but I'll risk it: there is no possibility of reducing gun crime through laws trying to forbid gun ownership. Even if you could stop all gun imports (which you can't) it's sttraightforward to make one in a properly equipped small workshop, and once made, it remains usable for decades. This is not just opinion: all the available evidence shows that "gun control" laws do not work. Any former Home Secretary, even shadows, ought to be able to tell him this. If he or they don't know, then they are not competent. If he does know, then he's continuing to perpetrate fraud on the British people. It's easy to laugh but at least David Cameron has shown that he is the only person who can deliver controlled immigration into Britain with his tough stance on the EU. "I suspect people might be getting weary of hearing me on this topic, but I'll risk it: there is no possibility of reducing gun crime through laws trying to forbid gun ownership." I'm sure you are right but unfortunately it's not what people want to hear. Shooting people is bad therefore guns are bad therefore they must be banned seems to be the general consensus. Without a lobbying organisation dedicated to reversing anti-handgun legislation I can't see a change either. The Libertarian Alliance is opposed to such legislation but they're not a single issue group and unfortunately don't have a large enough public profile. "For Labour, immigration minister Liam Byrne said the plans "are posture politics backed up by fantasy finances". He said: "His plans to shut down Britain's ID infrastructure will prevent us stopping illegal journeys and tackling illegal jobs. His plans will render this country defenceless against illegal immigration." Um, given we don't have ID cards at the moment, is this Labour minister saying we are defenceless against illegal immigration now? Little to object to on this one-excellent idea. (some of) you guys are learning from your mistakes. You never know you might stand a chance in the 2017 election :D.
Don't forget that fiver you'll owe me soon comstock. Only covers the next election I'm afraid, Andrew. I make no predictions beyond that. "It's easy to laugh but at least David Cameron has shown that he is the only person who can deliver controlled immigration into Britain with his tough stance on the EU." Are you smoking what we're smoking? Personally I think this country needs both a national ID database and border police and armed checkpoints inside the country and regular stop and search. Sounds rather like a police state YAA. Jonathan @ February 26, 2007 at 10:30: "Increasing border police is a waste of money … far better to spend the money on an identity card system". Only if the ID card scheme works. The scheme currently being developed by the Home Office will not. "Without identity cards you are unlikely ever to be found out again". 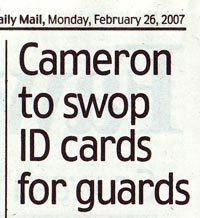 The same is true with the ID cards proposed by the Home Office. Jonathan @ February 26, 2007 at 16:05: "To prove your identity you won't offer the card you will offer a fingerprint and probably a PIN. The fingerprint will be checked via the internet against a national database to confirm identity". You are responding here to vague suggestions made by the Home Office but they have never said that this is how identity will be established nor where nor how often nor how much it would cost. In the film Minority Report, everyone is identified in real-time by their irisprint, determined by ceiling-mounted cameras. That is a film. Reality is different. The Home Office propose to base the ID cards scheme on smart cards. These only locate you if and when you use them. The rest of the time they do not help to locate you. They are useless to the police or anyone else trying to find you. The Home Office propose to identify people largely by their fingerprints. That would work if fingerprints were like bar codes. The ID cards scheme would become thereby a simple stock control system. Do fingerprints work like bar codes? No. In the UKPS biometrics trials, 19% of participants could not verify their identity on the basis of their fingerprints. In their report on the first year of operation of US-VISIT, the Department of Justice reported that 19% of VISITors had to be referred to secondary inspection -- their identity could not be verified at primary inspection. The fingerprint technology being proposed in the UK and used in the US is only 81% reliable. The Home Office expect there to be 50m ID cardholders at any one time. That implies that 9.5m people will have a problem using their ID card to verify their identity, whether or not they are linked to the National Identity Register by the internet. That will be a lot of angry people, angry because they are excluded, angry because £20bn has been wasted, angry because all a criminal or a terrorist has to do is say that his fingerprints "don't work" to bypass the whole scheme. I therefore congratulate David Davis on his initiative to repeal the Identity Cards Act. And I congratulate him on pointing out that the contractors working on that scheme could be laid off tomorrow without reducing our security. They are wasting our money on this scheme. They could put their good brains and energy to better use. Meanwhile, we already have an ID card scheme that works, that has been used for years by the police and others, that works across borders, that we have already paid for and that does not raise new civil liberties issues. We don't call it an ID cards scheme and most of the time we don't think of it as such. But that's what the global mobile phone system is – a dematerialised ID scheme. Finally, a partially formed immigration policy from the Conservatives in over two years. I hope that this will hush Tebbitt and other right wingers. Another Tory scam by Toyboy Tosspot Tory leader David Cameron. Do you all really think that 10,000 border guards in the UK are going to be effective? The UK´s borders are now thousands of miles long the other side of Eastern Europe and unenforceable and un-controllable. Once anyone gets into the EU they have the legal right to come to Britain any day they want, ALL 530 million of them, thanks to the Conservative party. In addition, Toyboy Tosspot Tory leaders proposals are designed to actively prevent our commonwealth cousins from entering the UK. Look at the thousands of Indian doctors working in the NHS to gain experience who have got to leave because of EU regulations. How many of you have friends relatives etc in the Commonwealth compared to friends and relatives in Bulgaria? The Conservative party is trying to hoodwink the public that they are doing something about uncontrolled immigration when they are still willing to give 530 million the legal right to live here. It just does not make sense, unless of course you are a tiny minded Tory voter with tunnel vision.